Mileages are listed one way; double the distance for round trip length. Various routes are listed, depending on the hiker’s desire as to length of trip. Many can be incorporated into loops or shuttle hikes. Any of the routes are acceptable to meet the Challenge requirement. For some towers, other routes are possible but must meet mileage requirements. Check with the Challenge Committee to confirm other routes in question. An easy hike off of the Blue Ridge Parkway or from the Pisgah Inn, Fryingpan Mountain is the tallest USFS lookout tower in western North Carolina at 70 ft. tall. Built in 1941 and supporting a steel live-in cab, this tower features the most stunning view of nearby Cold Mountain than anywhere else in the area. Its views of Mt. Pisgah, the Shining Rock Wilderness, the Cradle of Forestry, the Pisgah National Forest, and distant Mt. Mitchell and the Black Mountains are equally impressive. Built in 1934 and standing 47 ft. tall, the steel Bearwallow Mountain lookout tower straddles the Eastern Continental Divide in the southern Blue Ridge Mountains range. It hovers above a scenic bald mountaintop which features panoramic views of the city lights of both Asheville and Hendersonville as well as the deep Hickorynut Gorge and Lake Lure. The Great Balsam, Craggy, and Black Mountains are all visible from its perch. Reached by a mile hike on its access road, the mountain’s central location among North Carolina’s highest ranges offers the opportunity to identify a seemingly innumerable amount of nearby and distant peaks. Big Ivy Historical Campus - This tower must be driven and does not have a trail. Douglas Falls is nearby; Craggy Gardens is nearby and is the location of the Little Snowball Trail, which is also required for the challenge. The summit of Mt. Mitchell boasts a more extensive history than any other southern Appalachian peak. At 6,684 ft., ?Mitchell?s Peak? is the highest mountain in the eastern United States. Preceded by four different lookout towers, the squat stone observation tower atop Mt. Mitchell is scheduled for completion in Fall 2008 after construction closed the summit for over two years. 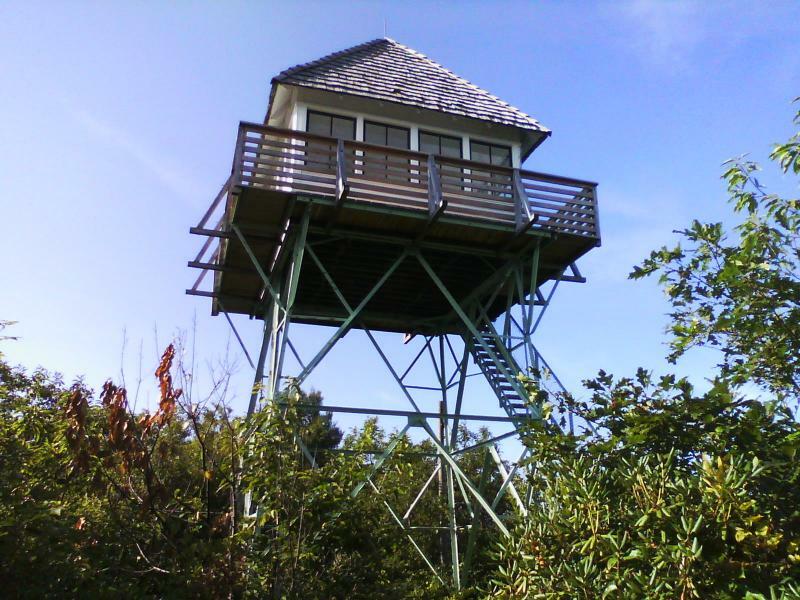 Replacing the 35 ft. former tower that faced structural deterioration and inaccessibility, a new 10 ft. lookout will soon offer views from the rooftop of North Carolina. The Green Knob lookout boasts the best viewing point of the rugged and tall Black Mountains range, including Mt. Mitchell, North Carolina?s highest peak. Accessible by a half mile trail from the Blue Ridge Parkway, or for a hardier workout - a grueling 3 mile ascent from the Black Mountain campground, 5,000 ft. Green Knob hosts a 21 ft. former live-in lookout tower built by the USFS in 1931. Staffed through the late 1970s, Green Knob was restored in the 1990s but has again suffered deterioration and desperately needs additional rehabilitation. Straddling the Eastern Continental Divide, the tower also features stunning views of the Great Craggy Mountains, Table Rock, Grandfather Mountain, and the North Carolina Piedmont.